is there any translation fot any language ? It would be useful and beneficial for the whole masternode ecosystem. Be carefule! Dev can block you if you asking questions about project. Got banned coz asked dev about their platform. All pics which they have on the site - only design. They do not have developers for start working on this platform! When i wrote (what i thinking) "So as i can see - right now this is another coin for coin with "maybe in future we will make platform if we will find developers for that"" Dev blocked me and deleted all my question! This project only for receive your money and Developer prefers delete your msg or ban you than answering on simple questions. Why did you have to make a new coin for this purpose? It seems like a waste of tech and time. Preparing a paid subscription for each level of services might be a better choice. If not, looks like a money grab imo. I don't know why MN Tracker rose more than sixty percent within the last day. Which characteristics/ spefications/ development plans of MN Tracker that they saw promising and ready to invest their money into MNT? why is this in your opinion a scam project...why do you SCREAM SCAM!!!! and not come with facts? 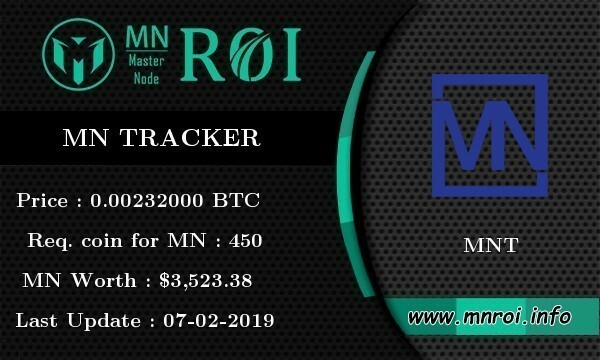 MN Tracker avalilable NOW on CHT. Join to us! like many other projects that have promised very large profits, the result is one zero value. think for many investors it will be a lesson for the future.